Wall Of Ice Surrounding Fukushima Will Contain Radioactive Water : The Two-Way Wastewater at the Fukushima Dai-ichi nuclear plant, which suffered major damage to its reactors in the 2011 earthquake and tsunami in Japan, will be contained with an underground frozen barrier. 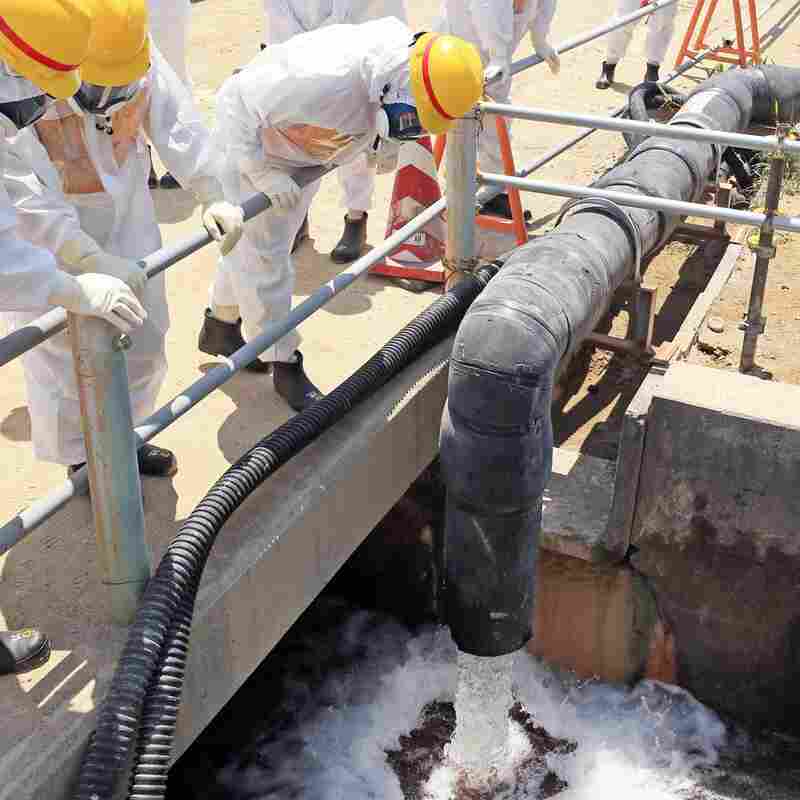 Members of a local government council check an outlet of a so-called groundwater bypass system as they inspect the crippled Fukushima Dai-ichi Nuclear Power Station earlier this week. Earlier this week, workers in Japan began constructing an underground "ice wall" around the melted-down nuclear reactors at the Fukushima Dai-ichi nuclear power plant. The wall is designed to stop hundreds of tons of radioactive groundwater from leaking into the nearby Pacific Ocean. Building a subterranean wall of ice sounds a little crazy. NPR's Geoff Brumfiel, who's been covering the story, says it is a little crazy — but not as far-fetched as it sounds. He answered some of our biggest questions about a construction project that sounds like it's straight out of Frozen. So ... what's an ice wall? When you have enough moisture in the soil, it's possible to actually freeze it. You dig holes every 3 feet for a mile around the plant and put in pipes. Then you run chilled saltwater through the pipes — which freezes at a lower temperature than freshwater — and that causes the soil to freeze. Slowly you can build up an impermeable wall, several feet thick. When water comes to the wall, it freezes. So you have this self-building wall. Why ice? Why not build a wall out of, say, steel? You need something very big, very thick, that can run for miles around the reactors. It's just not realistic to put in a metal wall, which could degrade over time. The best thing is to try to use something from the environment itself. This is a technique, incidentally, that's used in construction for tunnels, for trying to dig foundations in very moist areas like ports. It does work. Why is it still necessary? The accident happened in 2011. The problem with the reactors is that they still have hot nuclear fuel inside, and workers have to put water into them to keep them cool. But as you may remember, the reactors were heavily damaged in an earthquake and tsunami — so they leak. It's been hard to figure out why, because the inside of the reactors are very radioactive — they can only be accessed by robots. The site is also between the mountains and the ocean, so there's a lot of groundwater flowing through it, which mixes with the contaminated water. At the moment most of it is pumped into holding tanks that are popping up around the site, but they're filling up fast. And some of it is making its way to the ocean as well. What ideas do they have besides building an ice wall? They're trying a kind of crazy system to bypass the groundwater. You dig wells, pump out the groundwater, pipe it around the plant and release it. But that only takes care of a quarter of the 400 tons a day going through the site. How much does an ice wall cost? You can do it for under half a billion dollars. But remember, that's just to try to keep things stable. The actual cleanup of the reactors will be billions more.